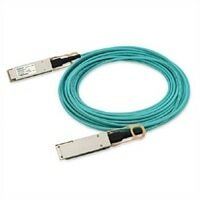 Dell Networking Cable ,QSFP28 to QSFP28, 100GbE ,Active Optical Cable (Optics included) , 30 mThis Dell™ Networking QSFP28 to QSFP28 cable provides connectivity up to 30 m. For use in qualified Dell™ platforms. Dell Networking adds additional functionality to the optics and cables family with the introduction of 100GbE Active Optical Cables and support for additional optics with OS9.10 and OS 6.3. This Dell™ Networking QSFP28 to QSFP28 cable provides connectivity up to 30 m. For use in qualified Dell™ platforms. Dell Networking adds additional functionality to the optics and cables family with the introduction of 100GbE Active Optical Cables and support for additional optics with OS9.10 and OS 6.3.